Manufacturer & Supplier of Wheelchair Lifts for Hospitals. Our product range also comprises of Power Wheelchairs, Hydraulic Lifts and Staircase Lifts. 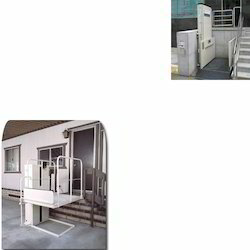 We are one of the leading manufacturers of Wheelchair Lifts for Hospitals in Chennai, Hyderabad, Bangalore and Kerala. We have gained expertise in offering genuine quality Wheelchair Lifts for Hospitals to the esteemed customers. These Mobile Lifts are manufactured using high-grade components and other material procured from some of the authentic vendors of the industry. Mobile Lifts are widely used by old aged & physically handicapped people. Besides, our quality controllers check these lifts on certain well-defined parameters to gauge their flawless nature. Lifts are also available along with Stretcher and Ambulance. Looking for Wheelchair Lifts for Hospitals ?